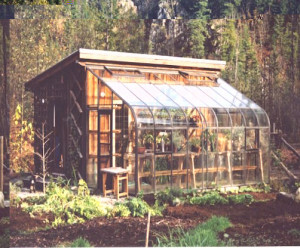 Acadian Lean-to Greenhouses are available with single tempered glass. All of the glass is tempered, including the curves. No acrylic curves like you find in other greenhouses. 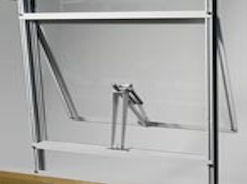 Multiwall polycarbonate may be substituted in the straight eave roof for the same cost. This way you will get additional insulation in the roof. Also, you will get the strength of polycarbonate in the roof, where falling objects may hit. These are just a few representative sizes for the Acadian Lean-To Greenhouses. These are available in many more sizes than shown here. The projection and the length can go up in approximately 2′ increments. Sizes are available up to 20′ 8 3/8″ projection and up to 51’6″ in length. For lower ranch style homes, we are able to offer our lower roof pitch. Frames are aluminum. The baked on enamel finish is available in white, brown or green as standard colors. 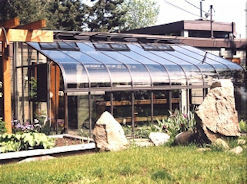 For more information on this greenhouse see our Acadian page. This greenhouse is rated for 32 psf snow load and 85 mph wind load. Please specify in customer comments which gable end you want the door to be on. Also, please let us know which side you want the door to be hinged on. Both of these are determined facing the greenhouse from the outside. Also, please let us know the height of your kneewall if you are building one. We will supply you with a foundation sketch after we receive your order. 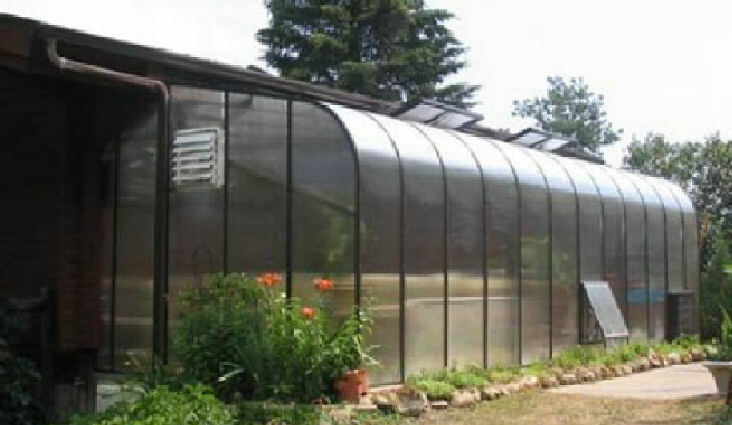 These greenhouses are custom built to your specifications upon order. They will take approximately 3 – 4 weeks (sometimes longer during busy seasons) to be built. There are many different sizes available for this greenhouse. If you do not see the size you want below, please contact us. Note the 3 open roof vents at the top of this greenhouse. The roof vents are powered by solar roof vent openers. 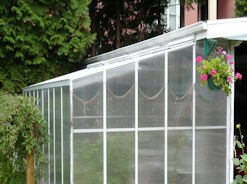 We can customize the roof on our Acadian greenhouse as low as a 2 1/2″ on 12 pitch. This is excellent for one story or ranch style homes. Note: Evangeline greenhouse pictured. This optional side vent allows for natural ventilation. We suggest putting one in the same bay as each roof vent for the best results. Do you have a limited attaching height, but do not like the look of the lower roof pitch? Or, you really need the extra height in your greenhouse? 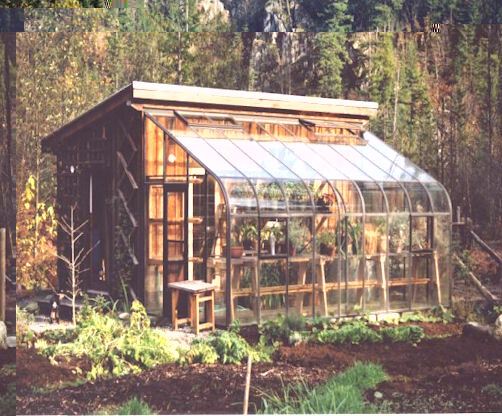 We have another option with our Acadian lean-to greenhouses . We can attach the greenhouse to your fascia board and supply a fill panel for the soffit area underneath. Contact us with any questions and to request a quote for this model. 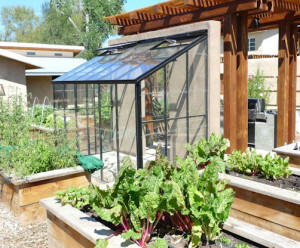 Additional designs are also available, so be sure to check out our full line of lean to and attached greenhouses. Lower roof pitch for 12′ 6″ wide lean to $1930.00 Add to Cart Minimum attaching height for 12′ model is 8′ 4″. Lower roof pitch for 12′ 4″ wide lean to $1930.00 Add to Cart Minimum attaching height for 12′ model is 8′ 4″. *There may be additional shipping for remote locations. This ships by truck. You are responsible for unloading. We do order a power lift gate with this greenhouse.